The Westland WS-51 Dragonfly helicopter was built by Westland Aircraft and was a licence-built version of the American Sikorsky S-51. In December 1946 an agreement was signed between Westland Aircraft and Sikorsky to allow a British version of the S-51 to be manufactured under licence in the United Kingdom. These would be powered by the 500 hp Alvis Leonides radial engine. A modified version was also developed by Westland as the Westland Widgeon, but it was commercially unsuccessful. The Dragonfly entered service with the Royal Navy in 1950 in the air-sea rescue role. A number were also used by the Royal Air Force for casualty evacuation. 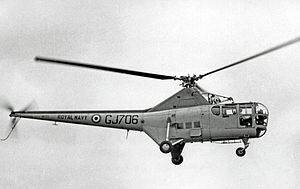 It was replaced in British service by the Westland Whirlwind, another derivative of a Sikorsky design, in the late 1950s. Fifty-one civilian WS-51s were produced. Examples were used by Pest Control Ltd for crop spraying and others were flown as executive transports by Silver City Airways, Evening Standard Newspapers and Fairey Aviation. Exported aircraft operated in Japan, Belgian Congo, Mexico and Norway. Air-sea search and rescue helicopter for the Royal Navy powered by a 540 hp (400 kW) Alvis 50 radial piston engine. 13 built, some modified later as HR.5s. Casualty evacuation helicopter for the Royal Air Force similar to the commercial Mark 1A, 2 built. Air-sea search and rescue helicopter for the Royal Navy. Similar to the Dragonfly HR.1, but fitted with all-metal rotor blades, 71 built some later modified as HR.5s. Casualty evacuation helicopter for the RAF similar to the Dragonfly HR.3 with all-metal rotor blades, 12 built. Air-sea search and rescue helicopter for the Royal Navy similar to the Dragonfly HR.3. Modified from HR.1 and HR.3. Civil transport helicopter powered by a 520 hp (388 kW) Alvis Leonides 521/1 radial piston engine. Built by Westland in the United Kingdom, 36 built. Civil transport helicopter powered by a 450 hp (336 kW) Pratt & Whitney R-985 Wasp Junior B4 radial piston engine, 15 built. Dragonfly HR.1 VZ962 on display at the Ta'Qali Museum, Malta. Dragonfly HR.5 WG719 on display at The Helicopter Museum, Somerset, United Kingdom. Dragonfly HR.5 WG724 on display at the North East Aircraft Museum, Tyne and Wear, United Kingdom. Dragonfly HR.5 WG751 on display at the Chatham Historic Dockyard, Kent, United Kingdom. Dragonfly HR.5 8-1 on display at the Aviodrome, Lelystad, Netherlands. Dragonfly HR.5 WH991 on display at the Yorkshire Air Museum, North Yorkshire, United Kingdom. Dragonfly HR.5 WN493 on display at the Fleet Air Arm Museum, Somerset, United Kingdom. Dragonfly HR.5 WN499 on display at AeroVenture, South Yorkshire, United Kingdom. Dragonfly HR.5 WP495 on display at RAF Museum Cosford, Shropshire, United Kingdom. Marked as G-AJOV. Dragonfly HR.5 on display at the Sri Lanka Air Force Museum, SLAF Ratmalana, Sri Lanka. Westland/Sikorsky S-51 Dragonfly on display at the Museu Eduardo André Matarazzo, Bebedouro, SP, Brazil. Westland-Sikorsky WS-51 Mk.1B 11503 on display at the Yugoslav Aeronautical Museum, Belgrade, Serbia. ^ "Worlds Helicopter Market 1968 pg. 50". flightglobal.com. Retrieved 16 June 2018. ^ "THE WORLD'S AIR FORCES 1955 pg. 658". flightglobal. Retrieved 18 October 2014. ^ "World Air Forces 1955 pg. 631". flightglobal.com. Retrieved 2 February 2015. ^ James 1991, p. 308. ^ Jefford 1988, p. 134. ^ a b "Westland S-5I". Flightglobal Insight. 1953. Retrieved 18 October 2014. ^ a b "Westland Dragonfly HR5 (WN493)". Fleet Air Arm. Retrieved 28 January 2015. ^ "THE WORLD'S AIR FORCES 1955 pg. 668". flightglobal. Retrieved 18 October 2014. ^ "Helicopters in Civil Operation pg. 388". flightglobal. 21 March 1958. Retrieved 18 October 2014. ^ "Westland Dragonfly". Demobbed. Retrieved 1 February 2015. ^ Bridgman, Leonard, ed. (1955). Jane's all the World's Aircraft 1955–56. London: Sampson Low, Marston & Company, Ltd. pp. 105–106. Howard, Lee; Burrow, Mick; Myall, Eric (2011). Fleet Air Arm Helicopters since 1943. Air-Britain Historians Limited. ISBN 978-0-85130-304-8. Jackson, A.J. (1974). British Civil Aircraft Since 1919 – Volume Three. Putnam & Company Limited. ISBN 0-370-10014-X. James, D (1991). Westland Aircraft since 1915. London: Putnam Aeronautical Books. ISBN 9780851778471. Wikimedia Commons has media related to Westland Dragonfly. Pictorial of a Westland Dragonfly Restoration. This page was last edited on 9 April 2019, at 09:33 (UTC).